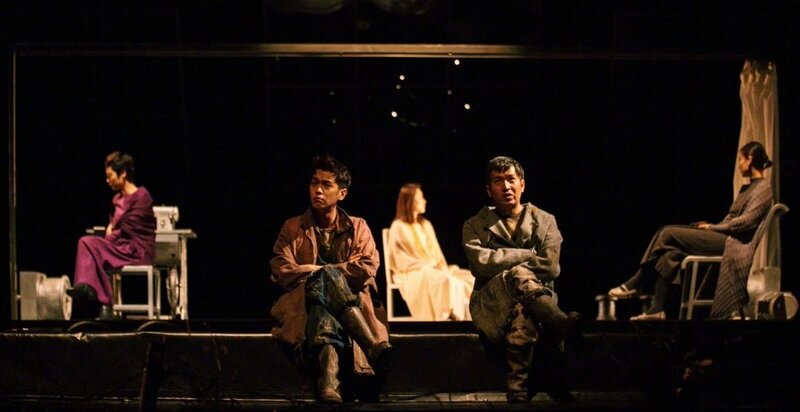 As most controversial modern spoken drama in China, The Three Sisters Waiting for Godot is ready to meet its audiences with compelling cast and revived story. The controversial modern spoken drama play Three Sisters Waiting for Godot will be back to stage at Shanghai Poly Theatre this winter. It is the first time for Lin Zhaohua, the Chinese avant-garde director and playwright, to have his work on show in Shanghai. Lin has gathered the three intellectual ladies with an eager for Moscow and the two homeless men who have been waiting for Godot together. The three sisters lives on a lonely island surrounded by water in the middle of the stage, while the two homeless men lives on a narrow land at the front stage. They live separately but all keeps waiting. Sometimes they cross the shallow water where subtle interactions happen. The sisters are long for going back to Moscow, while the homeless insist to “wait for Godot”. They keep wandering, with desperate hopes, stubbornness and sincereness. They do not set off or arrive, neither go to Moscow nor witness the arrival of Godot. The cast of the show consists of several renowned members. In the revived play, Cui Yongping, the experienced performer of Lin Zhaohua Theatre Workshop plays the role of Estragon, the homeless. He is also a member the director team of The Three Sisters Waiting for Godot. Another homeless man, Vladimir, is performed by the highly popular actor Zhang Ruoyun. The revived The Three Sisters Waiting for Godot will be greeting audiences in Shanghai and about 40 other cities in China, including Beijing, Chongqing, Wuhan, Shenzhen and Zhuhai. Do you want to bring your production to China as well?